This is a top quality part that a factory tuner would be proud to fit up. Looks a lot cooler, has a much nicer feel, and is stronger than oem. Tusk products are always good quality at a low price. I've been using it for a two weeks and Ive ridden one race with it and it seems to be holding up well. I really liked it was only half thr price of a new stock replacement. This is a great aftermarket choice for anyone that needs a new or even a spare shift lever. I have installed these on 2 different bikes and never had an issue with durability or fitment. Great product for the price point. I ride a lot and thought the anodizing would rub off quickly, but it has lasted longer than I expected. I went with this Tusk shifter to add some Yamaha blue to my bike, I also added the Tusk brake pedal and bling kit. So far so good. Fit perfect, looks good and seems to shift more precisely. Great price compared to high priced alternatives. Could not find matching tusk brake pedel for 690 enduro r ? Looks good and decent price, I’ve had no issues with it. Awesome lever for the price! would buy again and recommend. I bought this in order to replace my flimsy bent OEM lever on my KLR650. It was easy to install and also gives a newer, fresher look. Wonderful product. It worked well for the job. Worked as described and would highly recommend. 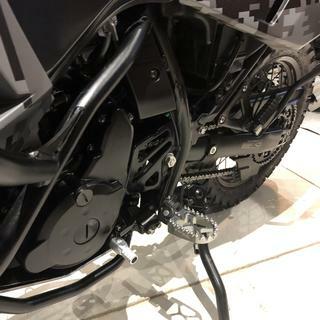 These TUSK shifters have been wonderful on every bike except the 2017 -present kx250f.. it curves much to close to the ignition cover,almost rubbing.. TUSK possibly may not have changed the contour of the shifters from the last generation kx250f. On all my yz’s , Kx super minis and ktm sx/sxf’s these are outstanding shifters especially for the price. Looks good on bike. A little long so I find it a bit easier to shift with boots on. Good value. With an item like this, they are bound to be used and abused. These are great for how cheap they are because if you hit something and need to replace, you aren't spending 100 for a lever that may break next ride. Its mid winter so I have not been able to ride,but I will be ready with a new shift lever that does not hit the engine on the up shift. My last one (bent) was a top name and expensive. The Tusk shifter is just as quality for a fraction of the price.Good product. I am jones'n to do some shifting. This lever is a great price compared to others and fit perfectly. Seems to be holding up well. I wish it was a bit longer or maybe had a bit more bite to it. It looks real nice on my black and white cr with hints of red so that worked out perfectly. I would recommend it to anyone in need of a quick fix for a bent shift lever. Great product. Takes a beating and holds up well over time. For some strange reason my bike seems to shift better. Looks nice too. Light weight. Fits perfect. Designed with a recess for the cable stop when using a cable lever saver. I love these shift levers. I have one on my LTZ400 and and I'm not easy on the one I have my ol' RMX250! Way better than stock, but in order to get it to fit my CRF125F big wheel, I had to have it pretty far out on the shaft. Worried it might not be enough overlap and may fall off one day. Might not be an issue for other bikes. Considerably cheaper than OEM and many other aftermarket brands. Fits nice and looks good too. Havent got much riding in on it so far but it seems to be holding up well. I like tusk quality! This beats the stock shifter I had on my crf250L only problem is I lost this shifter! bolt vibrated off and so did the shifter! Use a lock tight on the threads! Back to stock shifter, RMATVMC can u replace my shifter!?!?!?!? I’m very happy with my shift lever. It was better than I expected. But it because the one on my bike had some up and down play at the tip. Fit was perfect, looks awesome and now no more play at the tip... for a very good price, thanks RM. Shifter is solid, excellent grip on the boot and for some crazy reason i seem to find neutral easier now. Another excellent Tusk product. Fits perfectly and quality is at or above the OEM lever I replaced it with. Continue to be impressed with this line. After a year of riding the anodizing starts to fade on the tip. Not too bad considering the amount of shifting. BEST ANSWER: These do have the same specs as OEM. 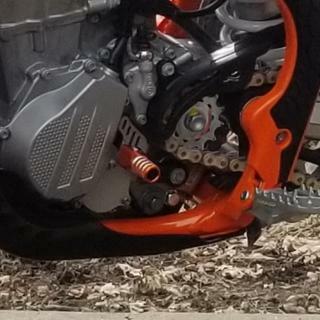 On my 2010 Ktm 250sx I noticed no difference in the shape or feel from the oem shifter. Seems about stock length. Perfect for size 10 boot. Will this lever fit a 2016 Honda CB500X? would this fit a 2009 yfz 450? Is the shaft steel or aluminum? BEST ANSWER: Aluminum. If you are using it on a KTM be careful. Mine came loose the first time I used it. I was able to tap it on tight, then used a longer bolt and washer to put more pressure to hold it tight, I also used lock tight too. Worked great. Happy riding! I have a 2005 CRF150F and i wear a sz 12 riding boots, i cant wear my boots right now with my OEM shift lever. Will this give me more room so i can ride with my riding boots? BEST ANSWER: My Tusk shift lever, purchased in March, 2017, is 4-7/8" (123 mm) from center of mounting/shift shaft to center of toe/folding-shaft. RMATVMC contacted me with your question about length of the Tusk shift lever, so I assume the part number you are looking at is the same as the one I purchased from them 2 years ago - from their customer records. No. It is very close to the same size as your stock shift lever. Have you tried repositioning the stock lever to a higher position? If that does not work, you may want to look into adjustable foot pegs to see if they will give you a little more room. I wear Fox Comp 5 boots on my 2003 CR250R with the Tusk shift lever. I moved the lever by 1 tooth when installing. That gave me the room I needed for my boots. Now it's great! I have sz 12 and ride a ktm450exc with no problem. Every Tusk product I've purchased I've been happy with! Does it come with the bolt? BEST ANSWER: Yes, a bolt came with my Tusk shifter. My application was for a Honda CRF 250x. But for this price point what is the point? Just get a new one. The KLR have a short shift lever currently. Does your shift length 1" longer like IMS? BEST ANSWER: It does increase the reach for the shift lever. I'm not exactly sure about the length, but I would estimate that it is around 1 inch. The Tusk shift lever is SOFT. On a tip over the lever folded and went through my engine case. I highly recommend spending the extra money for the Hammerhead lever. I put this on a TTR-50. Yes, it was about an inch longer than the factory lever. What’s the length of the shifter? From the center of shifter shaft to the end is 4-3/4. 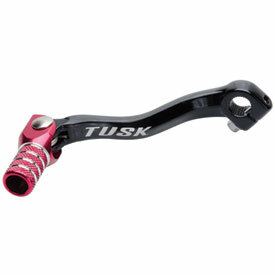 Do these tusk shifters fit any pen bike or atv because I have a yamaha blaster and was wondering if it would fit on it? BEST ANSWER: When you go to order it, it will ask for your brand and model your ordering it for. Then it will tell you if this part fits your bike. I installed it on a Honda TRX 400X and also a Honda CRF450R and both fit perfect. 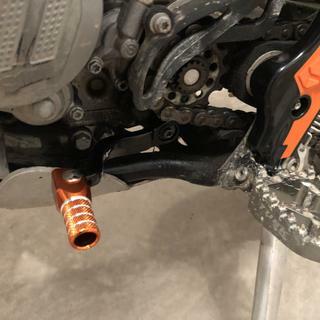 Hey fellow riders, will this shifter fit a TW 200? BEST ANSWER: This is a generic style shifter, so it all depends on the bore size of the shaft it's bolting too. Unfortunately this item is not listed to fit a TW 200 and will not function. I know this shifter isn't listen for my 2005 Raptor 660, but will this work on my transmission spindle? BEST ANSWER: I bought mine for a kx125, if the shift shaft is the same size, then it should fit. However, I have no experience with a Raptor. I do not know the clearance to shift up or down on the Raptor. If your bike model does not match you can always order try it and if it does not work return it! Will this fit a 2004 ktm 250sx? 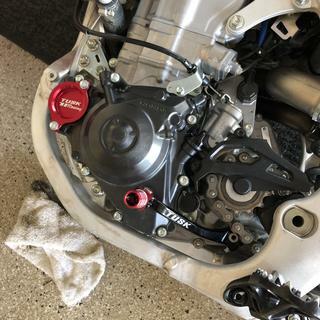 will this fit a klx 125? Will this fit kx 100? Would this fit my ktm 200 2002? Will the shifter fit the new Honda Rally CRF 250?? 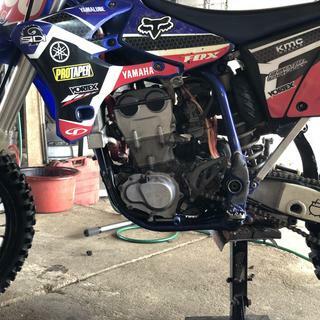 Does NOT fit the Honda Rally, neither does the Tusk Brake lever or the Flatlands racing Radiator Guard that your system says fits the Honda Rally... They do fit the CRF 250L but NOT the Rally..
Would this fit a 1988 kx80? Will this fit a Kawasaki klx250s 2009? When will the red option be back? BEST ANSWER: it is out of stock for certain machines. it will be available when we get this back in stock. Why can’t I get a red shift lever for my 2013 yz450f? BEST ANSWER: We do not make a shift lever in red for that machine. Will this fit a husqvarna 2017 fe 250? Will this fit a 2015 rmz450? BEST ANSWER: This will not. i apologize for the inconvenience. Will this fit a 2017 Husky FE 350? Its says it will fit a 2017 FC 350 and both bikes share the same part number for the shift lever. BEST ANSWER: this will fit your machine just fine. Will this fit a 2012 KTM xcw 450? BEST ANSWER: it looks like it is listed for it so it will fit. BEST ANSWER: The husky 350 is different then the FE450. this will not fit. i apologize for the inconvenience.